Give me a half hour with anyone and I’ll come away with a story. Every person has one. Some have more than a few. Take Dave Lesher, for example. This piece was supposed to be about Lesher’s beekeeping hobby, but his activities, interests and talents—his “secret lives”—are many. In addition to being a police services officer at Penn State Behrend and a beekeeper, Lesher is also a professional photographer, distance trail runner, cyclist, gardener, home brewer, clean-eater, and a website programmer/designer. Oh, and he’s also a veteran, husband, and father. Clearly, when Lesher is interested in something, he goes all in. But serendipity plays a role in most of his ventures, too. Twenty-five years ago, when he was working at a grocery store after having completed basic training in the U.S. Army Reserves, a coworker mentioned she was attending a municipal police training academy. Lesher enrolled a week later. After graduation, he was hired at Behrend. It’s a job he said he has enjoyed since day one. He even likes educating students who have gotten themselves into a bit of trouble. A serious health scare a decade ago inspired Lesher to begin exercising and taking a closer look at the foods he was putting into his body. He eats clean now, avoiding processed foods, meat, caffeine, artificial dyes and additives, and most forms of sugar, with one sweet and all-natural exception—honey. He found his first set of bees on Craigslist. “This guy was tearing a house down and found the walls were full of honey-bees, so he offered them up to anyone who would come take them,” Lesher said. “Cut-outs,” as such bee acquisitions are called, are tougher than simply scooping up a homeless swarm and encouraging them into a new home. Lesher is pleased to offer them a home, and the college’s maintenance and operations staff are just as thrilled to have someone nearby to call when swarms are found on campus. Except for the occasional replacement queen, Lesher doesn’t buy bees. He prefers to collect native bees since they are used to Erie’s climate. Lesher has a beekeeper’s hat, but doesn’t wear a full suit because honey-bees are rarely aggressive. He’s been stung only twice. The average hive makes sixty to eighty pounds of honey a year, which is harvested in the fall. Only a portion of the honey is taken, however, as the bees have to have food for the winter. A different kind of buzz—talk about the then-new World Wide Web—caught Lesher’s attention twenty-plus years ago. He began reading about, then dabbling in, website programming and design. He soon had paying clients (he still has some today) and a concern about finding adequate photography for their sites. So he began reading about photography. You see where this is going, right? Today Lesher also works as a professional photographer. He shoots family portraits, senior pictures, and weddings. Another hat he wears? College student. This fall he’ll complete his degree in General Arts and Sciences with an emphasis in Political Science. You may wonder where Lesher gets the stamina to keep up all of his hobbies, jobs, and activities. 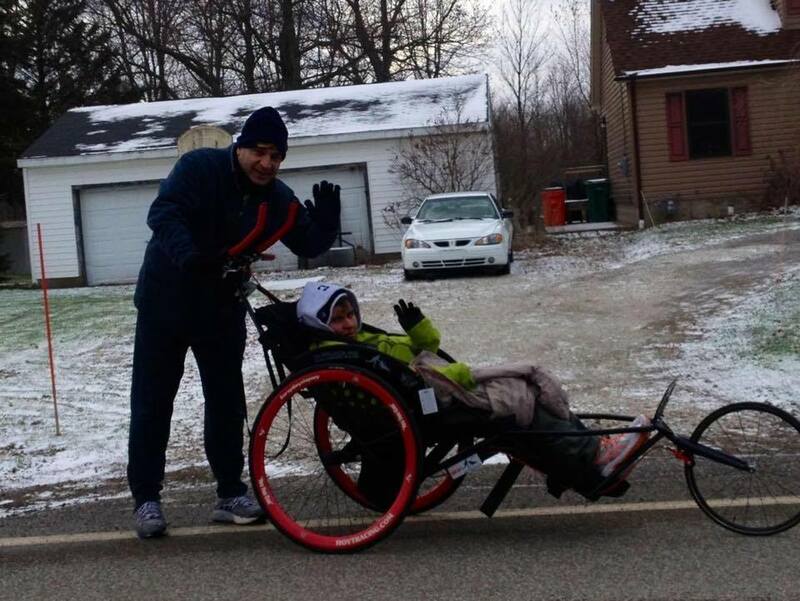 It’s a strength that is, no doubt, hard earned on the trails and roads around Penn State Behrend where he’s logged thousands of miles. Last summer, he did his first ultra run, the Megatransect, a formidable thirty-mile race up, on, and around Bald Eagle Mountain, just south of Lock Haven—with former Behrend engineering professor and trail-runner Dr. Chris Colston. Yes, with Lesher, we do know how it goes now—all the way. Honey-bees are not native to the United States. They were imported by European settlers. Honey-bees, while instinctual, aren’t very smart. “I have to have different landing strips on my hives or the bees will go in the wrong hive and be killed as invaders,” Lesher said. Honey-bees use dances to communicate. For example, when honey-bees find food, they do a choreographed “waggle” dance that instructs the rest of the hive where to find a food source. Honey-bees keep each other warm and fed over winter. Honey-bees keep the hive at about 92 degrees in winter, feasting on the honey they have collected all summer. Honey is harvested in the fall. Hives typically contain about sixty to eighty pounds of honey; some must be left for the bees to eat. Unhappy honey-bees will leave. If conditions in the hive are not suitable, the queen will call for a swarm and they’ll swarm and depart. The honey-bee queen is the sole reproductive female in the colony. She lays 1,000-to-3,000 eggs per day. Female worker bees perform all other colony duties. Male drones exist only to mate with a virgin queen. Drones are dead before winter. Drones are a liability to the wintering hive and are not allowed in after fall, so they die outside. Suturing—sewing together incisions or torn flesh—is a basic technique every doctor must master. It is, however, a skill that few undergraduate students have the opportunity to practice before entering medical school. 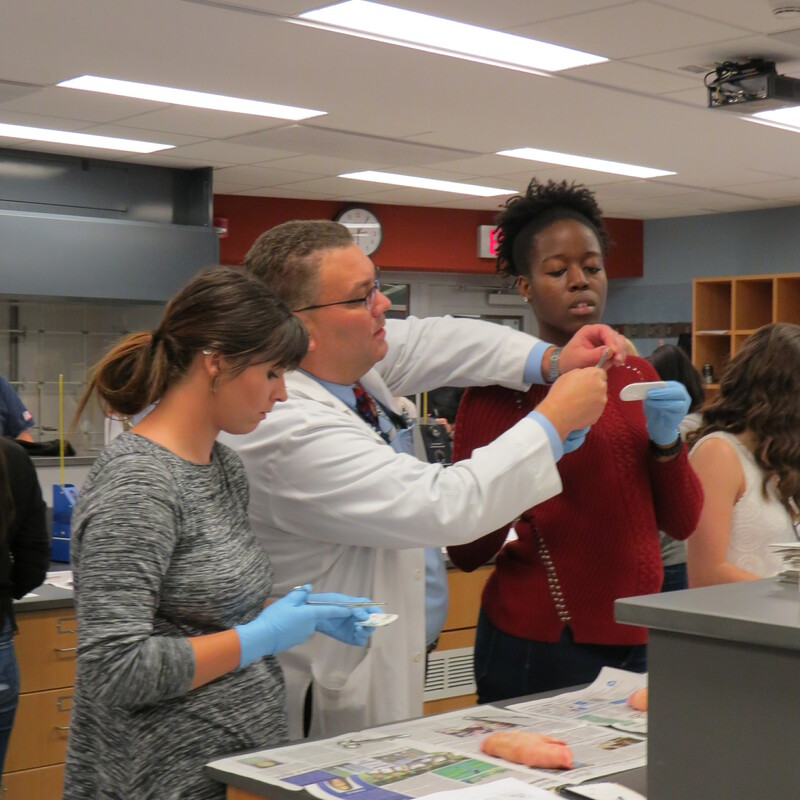 But, thanks to the U.S. Army and Penn State Behrend’s Pre-Health Professions program, nearly thirty undergraduate students from four area universities were able to try their hand at three types of basic stitches at a suturing seminar earlier this month. The class, offered by the Army Health Care Recruiting office in Pittsburgh and held at Penn State Behrend, was taught by Dr. Regan Shabloski, assistant dean for clinical education at Lake Erie College of Osteopathic Medicine, and a member of the Army National Guard’s Medical Corps. For two hours, students from Penn State Behrend, Allegheny College, Gannon University, and Mercyhurst University worked on severed pigs’ feet, practicing simple interrupted, running, and mattress stitches, using suturing kits provided by the Army. Shabloski taught students how to hold the tools, how to start and finish stitching, how to know which stitches to use, how to choose the proper sutures, and the importance of symmetrical sewing. Straight, evenly spaced stitches are paramount for patients. Staff Sgt. Benjamin Earle and Staff Sgt. Ricardo Grey, both Army medics, were on hand to assist Shabloski with training. The event was sponsored by the Army to bring attention to its Health Professions Scholarship Program, which provides tuition for up to four years of medical school to students pursuing an education at any accredited medical, dental, optometry, clinical or counseling psychology, or veterinary school, in exchange for a four-year commitment to working on an Army base after graduation. “Students have to apply for this program before they enter medical school, and we were finding that many didn’t know about it until it was too late, so we’ve been making an effort to reach students at the undergraduate level and make them aware of the opportunities available to them through the Army,” Earle said. Earle is quick to point out that being a doctor in the military does not necessarily mean working in a combat zone. Christina Hilaire, a junior Biology major who wants to be a doctor, participated in the suturing class and said the scholarship program is worth exploring. “My mother was in the military, so I’ve thought about it,” Hilaire said. 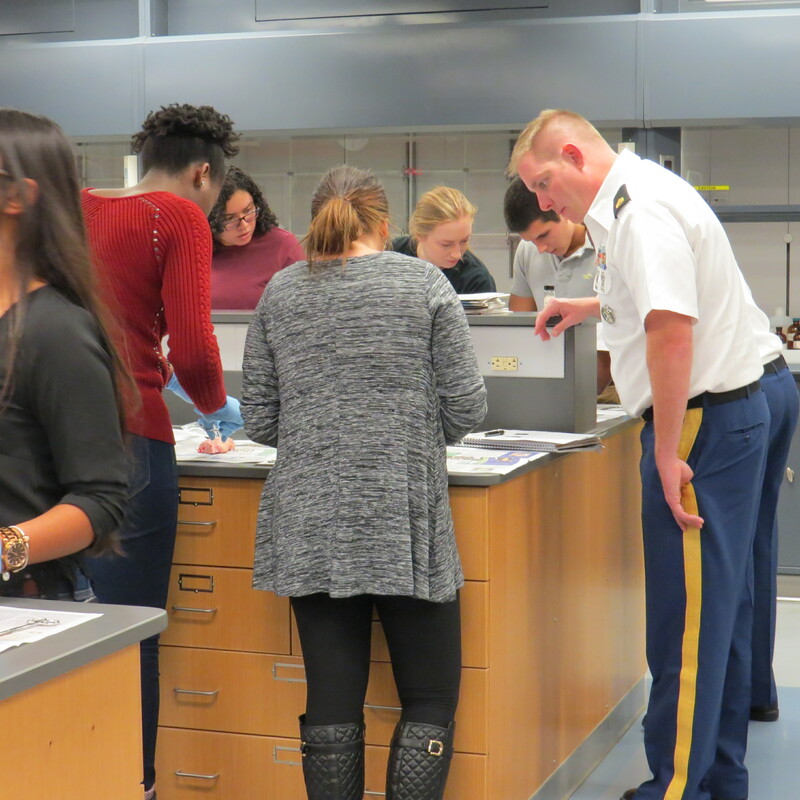 “It is a pretty sweet deal for students inclined to spend a few years working at a military base,” said Dr. Michael Justik, associate professor of chemistry and chair for the Pre-Health Professions programs. Justik helped bring the suturing class to Behrend. Among the perks? Full tuition paid directly to the medical school, a $20,000 signing bonus, a $2,000+ monthly living stipend, and health insurance, in addition to coverage of school-related expenses, including books, fees, and medical supplies. It’s a deal that, according to Earle, only gets sweeter after graduation when the newly-minted doctors are admitted to the Army at the level of an officer. The military recruits medical professionals in northwestern Pennsylvania because it’s rich in universities and medical facilities. 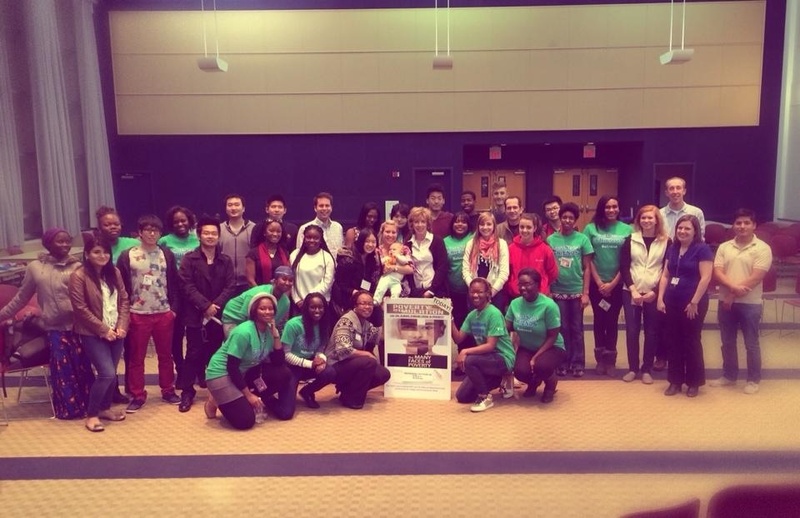 “It was a fantastic event that helped solidify my career choice. I want to be a surgeon and the suturing class made me realize that it really is what I want to do for a living.” — Stephen Wells, a Penn State Behrend senior Biology major. “It was really helpful to have Dr. Shabloski and the Army medics right there helping us and giving us tips. I took a similar suturing class in high school, but I learned some new and different techniques in this class.” —Thalia Soto, a Penn State Behrend sophomore majoring in Chemistry. Soto wants to be a pediatric surgeon. 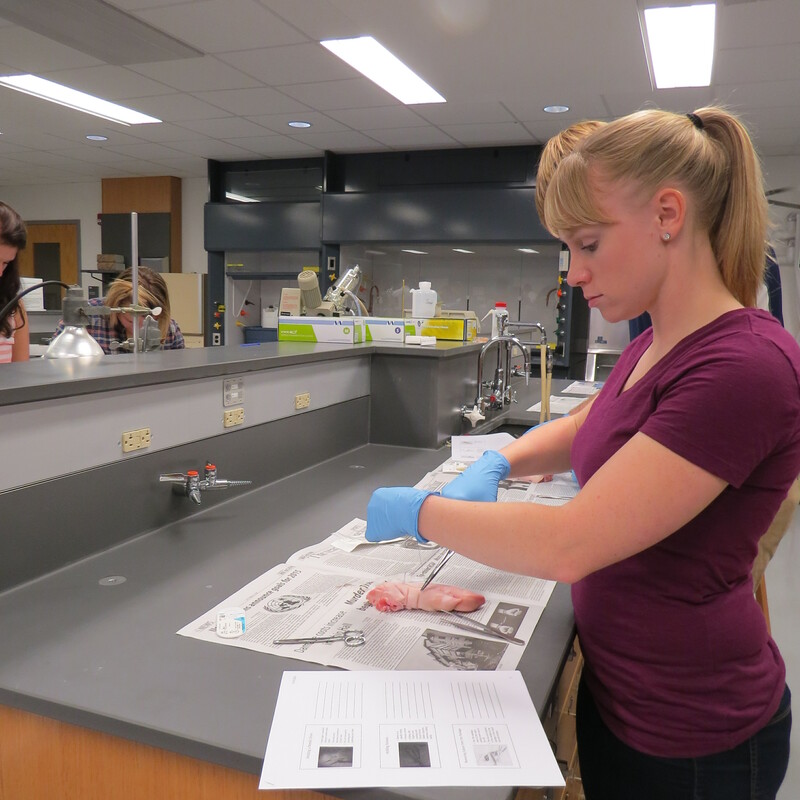 “I really enjoyed it because it was an opportunity to do some hands-on learning, which is not often a part of the pre-med curriculum.” —Margaret Dunlop, a Penn State Behrend sophomore majoring in Psychology. Dunlop wants to be an orthopedic surgeon. “The suturing class was a great learning experience in a fun, low-pressure setting. It was an excellent opportunity to do one of the many tasks that doctors and health professionals perform almost daily.” — Bethany Kelley, a Mercyhurst University sophomore Pre-Medical major. Kelley wants to be a physician assistant. Click here for more information about Penn State Behrend’s Pre-Health Professions programs. Click here or email Benjamin.d.earle2.mil@mail.mil for more information about the Army’s Health Professions Scholarship Program. 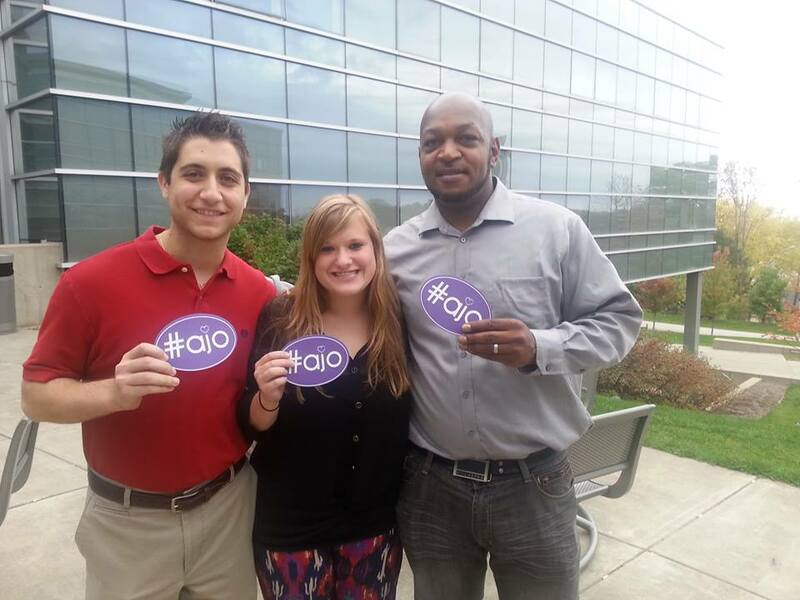 From left, Anthony Cremonese, Melissa Lichtinger, and Antoine Holman are part of the student team working on the #AJO Forever Foundation website. Melissa Lichtinger, a senior majoring in international business and marketing, was working at the Make a Wish booth at a women’s expo in Erie this October when she met Alyssa O’Neill’s father, Jason, and knew she wanted to do whatever she could to help with the #AJO campaign. AJO stands for Alyssa J. O’Neill, 18, who was a first-year student at Penn State Behrend when she died after suffering a grand mal seizure at home. The day before her death, O’Neill had texted her mother, saying they should meet at Starbucks for a pumpkin spice latte. After her funeral, her parents, Jason and Sarah, bought ten of the drinks for strangers. The barista marked the cups—using purple, a color associated with epilepsy awareness—with #AJO. 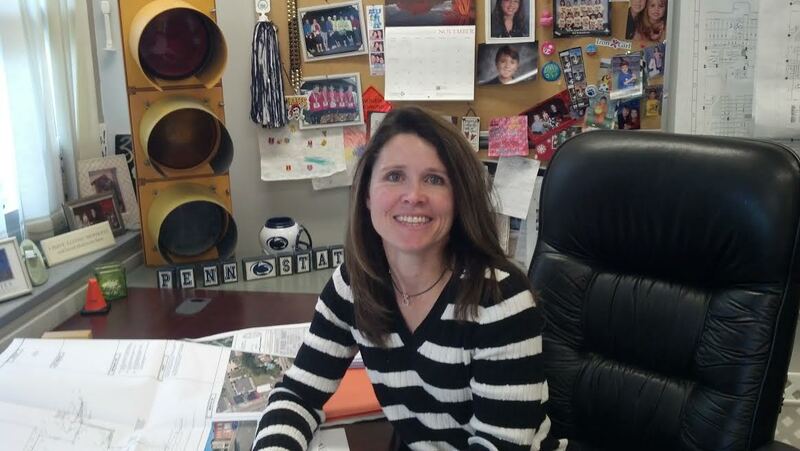 She asked Dr. Kathleen Noce, senior lecturer in management information systems, if Partnership Erie, a nonprofit outreach extension of the Sam and Irene Black School of Business, could develop a new eCommerce website and social media strategy for the AJO Forever foundation. Noce agreed and Lichtinger recruited four more students—Anthony Cremonese, Antoine Holman, Kelsie Noce, and Michael Thompson—to work on the project with her. The new site is expected to be completed by the end of the year. But Lichtinger didn’t think that was enough. “I really wanted to do something to raise money for the foundation,” she said. So she talked to Rhonda Reynolds, a Housing and Food Services employee who helped create a very successful employee service committee, and together they came up with the idea to “paint the campus purple” on Tuesday, Dec. 10. Students, faculty, and staff are all invited to wear purple and take part in making the letters #AJO for a group photo on Dec. 10 at 4 p.m. in the Clark Café in the Jack Burke Research and Economic Development Center. Participants are asked to give at least $2 to the AJO Forever Fund to be a part of the photo. Students will begin collecting donations at 3 p.m. The first 200 to donate will receive a free purple hat! The event is sponsored by The Sam and Irene Black School of Business, Partnership Erie, Behrend Commission for Women, the School of Nursing, and Grimm’s Embroidery. According to the United States Census, 15 percent of Americans, roughly 46.5 million people, live at or below the government-defined poverty line. For an hour this fall, Khardiata Mbengue and Teireik Williams could be counted among that group. 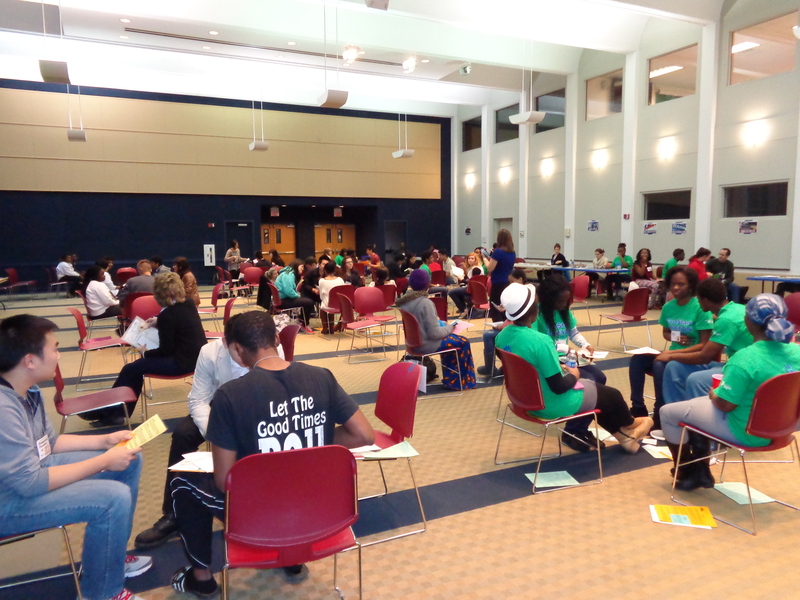 Mbengue and Williams were participants in a poverty simulation sponsored by the Office of Educational Equity & Diversity Programs and the Human Relations Programming Council. For Mbengue, a junior biology major, and Williams, a sophomore communication and creative writing double major, the simulation was a humbling experience. The two were paired up as husband and wife as part of the simulation. Steve: Hi Khardita and Teireik. Thanks for taking the time to join me today. So, to start, why don’t you provide me with a general overview on the poverty simulation? Khardiata: The poverty simulation is basically designed to help you get insight on how you would live if you were less fortunate or part of a low-income family. Going through the poverty simulation makes you realize how people often live in impoverished conditions even when it’s not their own fault. The system is against them, so they can never work their way up. You also realize that you’re never too far away from the life that they live. After college, we might be doing the same thing that we were doing in the poverty simulation. Teireik: The poverty simulation provided us with an opportunity to have the same responsibilities of a person who is poverty stricken. It was really designed for you to live a day in the life of the less fortunate. Steve: How exactly was the simulation set up? Teireik: The room is divided into different circles, and each circle had chairs that represented a family. Surrounding the housesholds were all of the different businesses and organizations that you had to visit. You also had to purchase a transportation pass for anywhere that you would go. Before the simulation, they gave you a portfolio that had every aspect of your life: how old you were, your family’s history, your savings and your belongings. Everybody’s budget was different. We had savings, and everybody had possessions and things that could be sold for extra money. Khardiata: And there was a cop, so you could go to jail if you did something wrong. Steve: Wow, so you could break the law during the simulation? Khardiata: Someone actually did that, and that person was the only one in the entire simulation who was able to pay their own bills. It just goes to show that it can be difficult to survive, even if you live an honest life. It puts you in a situation where you do what you have to do. Steve: So, can you give me an idea of what a typical day was like for the both of you? Teireik: She had to go to work, we had to take the kids to school, we had to pay bills, we had to sign up for benefits like food stamps, and we had to sell our belongings if we ran out of money. Khardiata: I literally had to run to work, so I would be there on time to receive the full benefits of my work. Even if your child did something wrong at school, it would affect your whole life. Teireik: Our daughter got suspended at school, so one of us had to be at home to take care of her. Khardiata had to go to work, so I was unable go out and pay our bills, search for a job or apply for benefits. Steve: It seems like the simulation required you to balance a lot of different responsibilities. How humbling was this experience for you? Khardiata: It was incredibly humbling. It showed me that you should be grateful for everything you have because not everyone is as fortunate. We did this for an hour, but the fact is that many people actually live this life. That was eye-opening for me. Steve: People living in poverty sometimes get a bit of a bad reputation. Did this change your perspective on them at all? 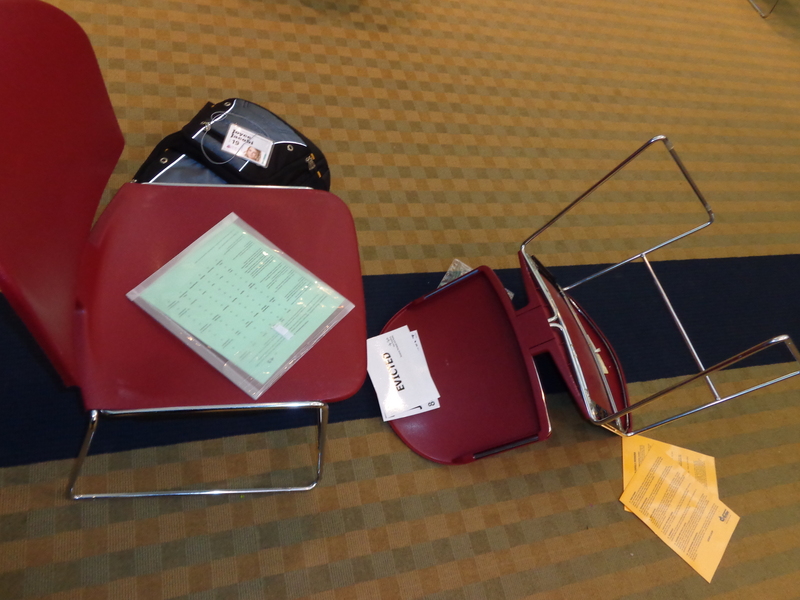 Khardiata: When I went into the Poverty Simulation, I had that same idea. I thought that if people are in poverty, they could work themselves out. But my opinion changed after living through it. We were doing all we could just to pay our bills and raise the kids, but it still was not enough. Expenses pile up on top of each other. As soon as you thought you had something handled, something else would pop up. That was a major thing that I learned. Teireik: This simulation shows that not everyone is afforded the same opportunities, and sometimes bad things happen to good people. It’s just out of their control. It’s not necessarily their fault, but they get a bad reputation for it. Steve: This was the second year for the Poverty Simulation at Behrend. Is this something that you would recommend to others? Khardiata: Yes, definitely I would. It makes you think, what if this does happen to me? It’s not farfetched to think that it could happen to you. It’s a very realistic thing, and it humbles you a bit. As college students, we seem to think that we’re all struggling, but it’s not as bad as it seems. Teireik: People should definitely experience it. If you get an opportunity to do something like this, why not? It’s much better to experience poverty through a simulation rather than for real. Penn Staters make an impact everywhere. Now, there’s a brand initiative that puts it right out there. The University will introduce the initiative on Saturday, October 12 during halftime of the Michigan game in Beaver Stadium. Penn State Behrend will be unveiling the brand message on Monday (October 14), and students are invited to be part of the announcement. Come watch as your fellow students unfurl a big banner with the theme of PSLH (that’s your only hint!) from the balcony of Lilley Library facing the Bayfront Highway. If you can attend, you’ll see the action from the lawn just below. See a short yet dynamic video, grab a cookie, and get your free theme button and vinyl window cling–while supplies last! Join us Monday to see and hear just how PSLH.